Ace Aquatics specializes in designing aquariums, ponds and water features. Which are not only aesthetically pleasing, but also as unique as the homes, offices and landscapes which they accentuate. All Ace Aquatics creations feature top quality filtration to ensure the water quality your fish need and the water clarity that you want to see. A first class water feature begins with an Ace Aquatics design. The key to an amazing water feature is proper maintenance. Pumps, filters, lights, in fact ALL equipment needs to be maintained at some point in time if it is to function atoptimum capacity. 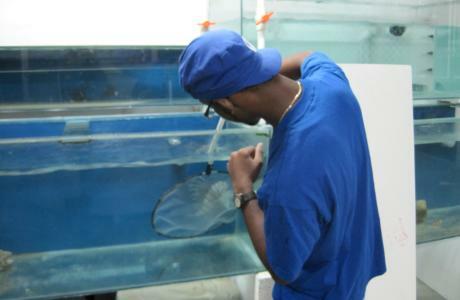 Water changing, cleaning of ornaments, tending to plants, medicating and health checks, water quality testing. We do it ALL! Call us and we’ll design a maintenance program tailored to suit your specific needs. 1. Planning, design and logistical analysis PRIOR to installation. 2. Sizing of necessary equipment and accessories for spectacular displays. 3. Identification of possible long term problems. 4. Problem solving and trouble shooting. 5. Disease diagnosis and treatment of fish and water plants. 6. Provision of stocking plans for display aquariums, ponds, irrigation and game lakes.